Pronounced "Gren-ich" the modest town of Greenwich on the south east side of London is only a short tube ride from central London. Greenwich is home to the Royal Naval and Maritime museum and Royal Observatory. The observatory sits atop a large hill in the middle of Greenwich Park. If you are up for a stroll and some decent hiking then Greenwich Park is the place to go. Layered with multiple hills the park is great for a day trip. At the top of one of it's peaks is a view of everything London has to offer. The walk is well worth the effort. Along Parliament Street there are numerous statues commemorating the people who helped build the nation into what it is today. There are two statues in particular worth mentioning. The first is the Cenotaph with the words "The Glorious Dead" engraved on both sides. 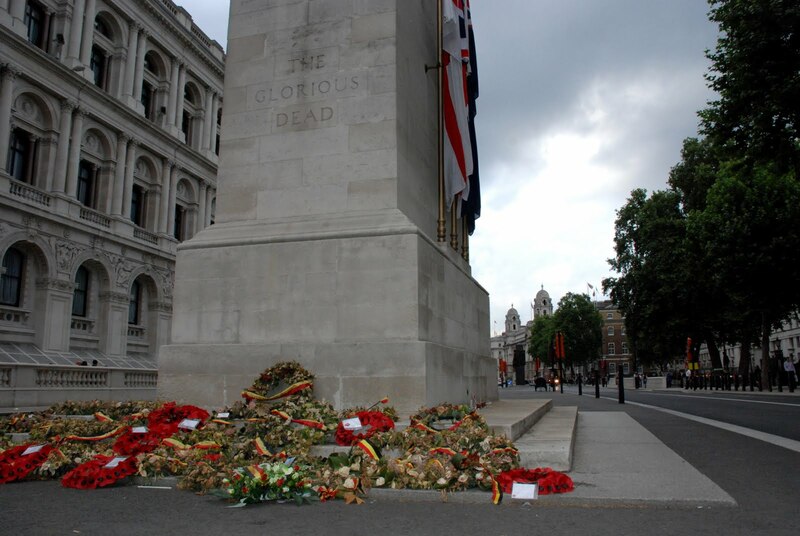 This modest statue, constructed by Sir Edwin Lutyens in 1919 and 1920, is adorned with a wreath on either side in remembrance of those who have fallen through Britain's conquest across the globe. Another is the stoic bust of Commander in Chief Sir Douglas Haig, commander of the British armies in France during WWI. Haig sits atop a black stallion facing Parliament. His hand twitches with a painstaking Ow! This isn’t the sound of agony, nor is it the jarring of arthritis. This is Billy Jean. Not in the sense you and I are accustom to at least. As the daily hustle and bustle rushes past the Leicester Square pitch our maestro, the man holding the red electric guitar, guides them with the music of Michael Jackson. The crowd is alive. Like that of an orchestra in pure metaphorical illustration every instrumental section is represented. At the helm is Emmanuel Pontes he stands about six feet tall, wiry, and transfixed on his craft. The ambiance of the crowded London Tube station creates a fantastical picture to accompany our gaunt maestro. Like a crowd awaiting a performance at the Royal Albert Hall the curtain raises and the group starts to play. The nimble string section rushes quickly past on their way to their train. Pontes just casually nods as the pieces fall into place. Not missing a beat he bends the next note right on que. His audience is slightly amused. The change hits the open guitar case. They need more! The loud brass section is making their way down the stairs. The sound only adds to Pontes’ raw unfiltered emotion. In the distance just over the top of the escalator the bass section can be seen. Weezing and out of breath they stand as the escalator slowly brings them to Pontes’ feet. More change hits the case. To him, this is his life, and his performance means everything. Pontes is a street performer. This is London. He is here to work. The domain of a street performer is called a “pitch.” A pitch can be seen in every tube station in London. In fact, of the 25 tube stations in London’s metropolitan area there are 39 “graphic semi-circles,” otherwise known as pitches. The city of London takes its performances seriously. Home of the Globe theatre and the Royal College of Music there is very little tolerance for a sub par routine. In London even the street performers need to have chops. In London it is unlawful to busk in a transportation station without a permit. As of November 24th, 2005, to perform on the street for profit whether as a full time career or a job on the side a performer must audition. Under the Licensing Act of 2003 any regulated entertainment, that is, entertainment that involves an audience, music, or any physical means such as dancing and boxing, requires a license. Busking seems like an odd profession. Where did it come from? The English word “busk” actually comes from the Spanish buscar which in turn comes from the Latin buskin. These terms mean “to seek.” So, a busker is “literally” seeking attention, money, and fame. Every culture has their own unique term for a busker. The French use the term Troubador or Jongleur. In Mexico buskers go by the name Mariachi which is generally a group of street performers. The Germans use the term Strassenmusiker, while the Russians say skomorokh. The practice of busking has been around for centuries, as old as antiquity itself, because it presents the most human of professions. Not only do buskers perform, they have to connect with their audience. A busker only makes a profit to the extent that he can connect with the audience. He has to implore them to give him his salary. But by no means is a busker a begger. A busker has to showcase his skills. He has to make a statement that “this is who I am and this is what I can do.” Then the society decides whether he will perform another day. This is a very dramatic and sobering reality for these starving artists. But do all street performers necessarily starve? Enter stage right, Ramadhami Kayimanda. Mister Kayimanda, age 50, is from the tragedy stricken country of Rwanda. I found Kayimanda in the Westminster Tube Station playing renditions of the major scale. Kayimanda came to London because it is an “easy place to play music” and is “not too far from Africa.” The people of London are noted for their chivalry and to Kayimanda “the people here appreciate the music.” So much in fact that Kayimanda can make about fifty pounds a day just from a few hours of busking. That is around eighty USD or nine and a half dollars an hour. In the States working at a desk job for eight hours a day at nine dollars an hour would earn you roughly what Kayimanda earns playing saxophone in front of a live audience for just three hours. Maybe it is time for a career change? London is known for its high taxes. Just ask Boston. In London as of 2010 the minimum wage for a person over 22 is £5.73 which works out to roughly $9.23 an hour. That is two dollars higher than the United States. But if that’s not enough the city of London has a “scheme” called The Living Wage. Businesses in order to ensure quality service can sign up for this scheme that requires them to pay £7.45 an hour, or $12.00. That’s right. Businesses in London are not happy about underpaying people. So what is the drive behind working for change? Take Bucky, Ramadhami, and Michael and contrast their stories. Bucky can get by because he splits his salary with his wife who is a nurse. Ramadhami proclaims that he makes about minimum wage in far less time than the average worker. Michael says he can “pay the taxes.” These three musicians from various backgrounds end up at the same conclusion. Busking is not easy. But it is doable. The reasons given to busk in London are quite substantial. They have an “appreciative audience.” The pay is decent. The musical history of London is enormous and elegant. And having to audition to be a street performer brings a level of quality and control to the field. With quality and control comes respect. Our ‘maestro’ is no exclusion. Emmanuel Pontes, 35, is from Brazil. He works as a part time busker and full time music teacher. When asked how much of his salary is generated from busking Pontes says, “It is part of my income, gigs, busking, teaching music, etc...any kind of event that is related to music.” Pontes chooses to work in London because of the atmosphere. He began busking when he lost his job in a shop. When asked ‘Why did you choose London’ he replied with a grin, “London, it’s the best place to learn English, so that was my first attraction...also to work as a musician.” There it is. London has what people need. To Pontes the need to play music and to learn English, one of the dominating languages of the working world, brought him to London. The fact that Emmanuel Pontes is a practicing musician is enough for him. The street performer goes into his field with a predisposition to enjoy ‘rice and beer.’ He has to. No matter how you slice it, being in any field requires talent and hard work. But even the most talented do not always cut it as a street performer. To sacrifice and fully own a profession is a hard decision for each and every performer that takes to the pitch. Certainly following a passion is a stronger motivational force than monetary gain. It isn’t always roses though. The competition is fierce. A musician can only play for four hours a day and that musician needs to get ahead of his competition and schedule pitch time. Pontes says, “It’s very hard, we are 260 licensed musicians, so it’s a lot of competition.” Muttle remarked that he read an article where a man busked for only forty-five minutes and gave his verdict about the profession. Muttle remarks, “This to me is like a golfer playing one hole of golf and determining that all golfers’ games will be the same as that one try. Anyone that says, "This is what busking is all about" has no idea what busking is all about, it is just their own opinion.” Is the undeniable truth behind being a successful busker in London ‘practice makes perfect?’ To some, yes, practice is always going to make you a better performer. But to others, luck is a major factor. To Bucky Muttle “There is no set guideline or formula for how to busk. There is no equation as to how much you will make. Sometimes playing terrible and out of tune may bring in lots of cash while playing great may bring in nothing.” The amount of practice and eight a.m. phone calls to the London Transportation Authority only serve to provide the opportunity to busk. A busker will busk every day s/he can. While being in the spotlight is enticing, the majority of buskers go unnoticed. The best buskers, the men and women who ‘profit’ the most, are the performers who accept the skewed balance of the invisible man and the rock star. Parliament. Derived from the french world parler, or, to "speak." This is an accurate account of what the traditional idea of Parliament is in modern day England. Along the river Thames stands the mighty walls of the Palace of Westminster, the seat of England's highest power, Parliament. Built in the eleventh century, the Palace was originally the primary residence of the King of England and his predecessors. After the fire of 1512 the palace was rebuilt and was used as the location for both houses of Parliament. In 1834 a second fire tore through the building once again reducing most of its interior to rubble. To this day the House of Commons and the House of Lords meet to "speak" about the issues at hand for England and its commonwealth. One of the most iconic and notable attractions of Westminster is the impressive clock tower "Big Ben." Majestic. Ornate. And overpowering. No Londoner has an excuse for being late to work. The clock tower houses five massive bells. The four smallest ring every quarter hour, while the fifth bell, aka "Big Ben," sounds on the hour. This impressive view can be found right across the river Thames on the Jubilee Walkway. Crossing the Westminster bridge to South Bank is certainly worth the effort. The South Bank is home to the London Eye, the Marriott Hotel, St. Thomas Hospital and dozens of street performers and vendors. South of the Thames. The South Bank. This stretch of waterfront property is home to the London Eye. Along the strip are various street performers practicing their craft. Anywhere from oil paintings to "poppin' and lockin'" can be found on South Bank. For those with an interest in reading, topography, and artwork, under the Waterloo Bridge a large "print vendor" area is buzzing with activity every day. Street Performer- "The Juggler" Covent Gardens Food Stall- Crowd enjoying a midday meal. Sextet Street Performers- Young musicians performing Mozart and other classics for change. London is definitely a labyrinth. It is astounding how many shops and back alleys are tucked away in the most unbeknown places. One specifically interesting locale to visit while in central London is none other than the Covent Garden. Overshadowed by SoHo to the west, St. Paul's Cathedral to the east, and Parliament to the South, Covent Garden in aesthetics and appeal can hold its own against these massively impressive attractions. Known for an abundance of street performers and food stalls it is an excellent place to go out for a midday meal with friends and family.